When US-based label Secrets of Giza released the Gates CD/DVD this year it was a significant milestone for Scott Baker, the Melbourne-based artist behind the Abre Ojos moniker. 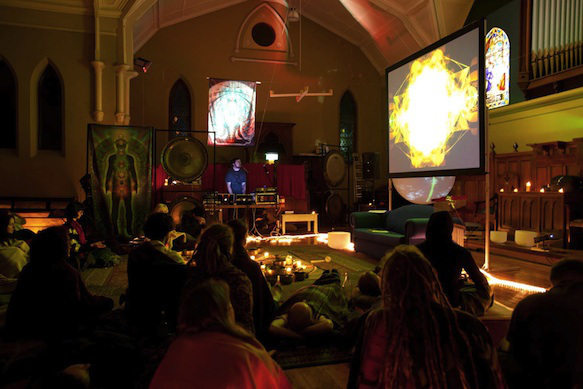 The dual disc package captures the “sound and vision for dystopian meditation” of live shows. Baker orchestrates single-take tracks interacting with Quartz Composer visuals prepared to complement the complex audio chains incorporating voice, modular synth, drum machines and various effects. The live performances provide an interesting point of contrast to the usual focus of most live music and art shows. Where these events use alcohol as a social lubricant, the meditative focus of Abre Ojos’ shows aims for a different atmosphere. Churches are a more likely venue for show utilising multiple projectors and layered visuals with harmonically-rich sounds from a modular synth accompanied by droning vocals. Abre Ojos’ current set-up for live performances is about a lightyear ahead of the rig Baker was using when I first saw him competing as part of a duo in a battle of the bands in Wagga Wagga early last decade. Performing live electronic music on computers, they progressed to the next round but there the judges didn’t agree that two guys using computers could be considered a band — even though their branding and visuals made it clear they had a bigger focus than performing music. It was while teaching in Wagga Wagga that Scott Baker developed his interests in art, video, music and generative approaches to all three. As a member of the Wagga Space Program he contributed to the Unsound Festival that would inspire the Polish festival that has since appeared in New York, and this year Adelaide. In 2004 Baker was partnered with Western Australian artist Alan Lamb and built a set of wires that act like a large-scale aeolian harp. These wires produce drones and rhythms, their pitch rising from low frequencies as shifting harmonics caused by the vibrations created by winds. While changing winds influence the sounds of Alan Lamb’s wires, they are one influence on the sound of Abre Ojos as Scott Baker explains. His interest in synthesisers was sparked during time in London and the meditative direction that has developed since returning to Australia. The return to Australia gave Baker the space for new equipment and the use of modular synthesisers became a key part of the sound of Abre Ojos. Anyone who has a casual interest in sound — such questions as whether there really is a ‘brown note’? — will be aware there are widely varied interpretations of the effect sound has on a human. Psychoacoustics is more than a cool word, there are many discussions around the use of sound in rituals and other applications. The Hindi belief system of chakras is one area that took Scott’s interest and became a topic of research. Worshipping live performance seems a logical extension but it’s an environment that provided an unwelcome contrast to Abre Ojos’ explorations. After Chakras and Coalessence came Haxan, an exploration of witchcraft through repurposing an early European film. One of the changes in Gates was shorter track lengths, moving away from the meditation aspect of my music into something shorter, darker, more aggressive and to the point. Unlike previous releases there wasn’t an external theme as such to research, such as chakras, witchcraft, elements, etc. Instead there was a deeper personal research, how to find a point of stability again after busting through this artificial threshold of control structures with few strategies to deal with it. It’s on this existential note that Abre Ojos leaves us but now you can see the artist’s discography records Baker’s personal journey in sound and vision. He calls himself a student and he’s a keen one, researching aspects of his craft. The material is uncompromising and reflects a process of systematically exploring his practises in creating live electronic music over the last decade. It’s fascinating to immerse in Abre Ojos’ recorded output and consider how Scott Baker’s aesthetic has both technically and personally evolved.